Magnesium and zinc are minerals essential for human health. Magnesium plays an important role in bone health and blood pressure regulation. The recommended dietary allowance, or RDA, for magnesium for men is 420 milligrams, or mg, and for women, 320 mg. Zinc is important for the metabolism of the foods you eat, DNA synthesis and wound healing. The RDA for zinc is 15 mg for men and women. In this article, 420 mg is used to calculate the percentage of RDA met for magnesium for each food item. The best food source of magnesium and zinc are oysters. A 3-ounce portion of cooked oysters provides 81 mg of magnesium, or 19 percent of the RDA, and a whopping 154 mg of zinc, which is well over 1,000 percent of the RDA. A 3-ounce portion of queen cooked crab offers 53.5 mg of magnesium and 3.1 mg of zinc, making it a good food source of magnesium and an excellent food source of zinc. A 3-ounce cooked serving of bay or sea scallops offers 46 mg of magnesium, or about 11 percent of the RDA, and 2.4 mg of zinc, or 16 percent of the RDA. A serving of Alaskan king crab, 1 leg, or about 134 grams, cooked provides 84.4 mg of magnesium, or 20 percent of the RDA, and 10.2 mg of zinc, or nearly 70 percent of the RDA for this mineral. 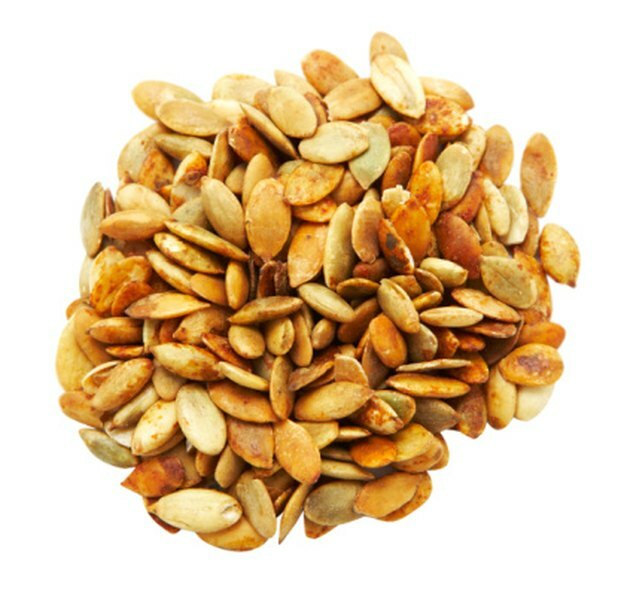 Roasted pumpkin seeds provide the most magnesium and zinc. A 1/4-cup serving offers 303 mg of magnesium, or over 70 percent of the RDA, and 4.2 mg of zinc, or 28 percent of the RDA. Second in line are toasted sesame seeds. A 1/4-cup serving offers 111 mg of magnesium and 3.3 mg of zinc, or over 20 percent of the RDA for both minerals. The nut that provides the most of these important minerals is the Brazil nut. A 1/2-cup serving of whole nuts offers 250 mg of magnesium, or nearly 60 percent of the RDA, and 2.7 mg of zinc, or 18 percent of the RDA. Cashews and cashew nut butter are rich in these minerals. A 1-ounce serving of dry roasted cashews offers 75 mg of magnesium and 1.6 mg of zinc, or 18 and 11 percent of the RDA, respectively. A 2-tablespoon serving of cashew nut butter offers 82.6 mg of magnesium and 1.6 mg of zinc, making it a good food source of both nutrients. Soybeans are an excellent food source of magnesium and zinc. A 1/2-cup serving of raw soybeans provides 261 mg of magnesium, or over 60 percent of the RDA, and 4.5 mg of zinc, or nearly 1/3 of the RDA. Most fortified, ready-to-eat breakfast cereals are vitamin and mineral fortified. A 1/2-cup serving of ready-to-eat wheat germ cereal, toasted, offers 181 mg of magnesium and 9.4 mg of zinc, or over 40 and 60 percent of the RDA for these minerals, respectively. A 1/3-cup serving of 100 percent bran cereal, such as Kellogg's® All Bran™, provides about 81 mg of magnesium and 3.7 mg of zinc. Yogurt is the only dairy product that offers appreciable amounts of these minerals. Eight-ounce low-fat, fruited yogurt offers about 37 mg of magnesium and 1.8 mg of zinc, qualifying it as a good food source of both of these minerals--good food sources provide at least 10 percent of the RDA for a nutrient.